Maxine Wade has always had an interest in creativity and trained as an Art teacher at Melbourne University, going on to teach in a variety of secondary colleges for 27 years. She then operated a picture framing business for 5 years, before beginning tutoring adults in watercolour, drawing, life drawing and mixed media at many art societies in Melbourne. She was a signatory member of the Australian Guild of Realist Artists (AGRA) for 15 years (2 of those serving as a councillor there, as Professional development Officer) and a member of the Watercolour Society of Victoria for 20 years. Maxine has won many awards for her work, most recently Highly Commended Kenneth Jack Memorial Award, Montsalvat 2010 and Best Watercolour at the 2009 Castlemaine Art Show, and her work is held in many collections. 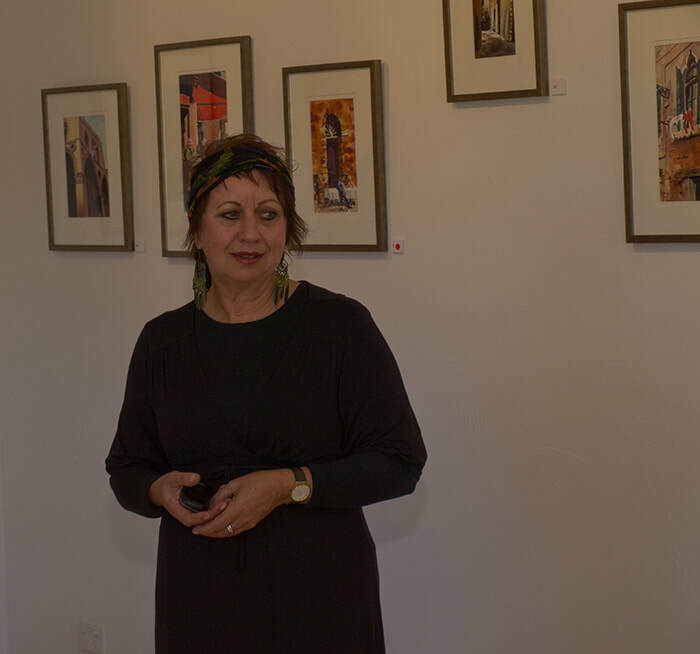 She has held many solo and joint exhibitions over 35 years and is currently tutoring at Victorian Artists' Society (watercolour), Brighton Art Society (watercolour & mixed media), Glen Eira Cheltenham Art Group (watercolour), life drawing at Ashburton Community Centre (2 classes running) and life drawing at McClelland Guild of Artists. She was Artist in Residence for 2 years, teaching watercolour at Camberwell Grammar School. She also teaches workshops and demonstrates at many Melbourne and regional art societies throughout the year. Maxine also judges art shows in metropolitan Melbourne and regional Victoria. She operates paintED. Tours to Italy (2011), France (2013), Italy (2015) and Italy (2017) (Venice & Santa Margherita).and a planned tour for 2019 to France (Nice and Aix en Provence)...... where painting & sketching on-site is combined with gallery visits and a lecture by Maxine on the artist in focus for the tour. Next tour was again to ITALY 2017 to Venice & Santa Margherita on the Italian Riviera,......I returned on October 8th after a wonderful tour with sunny days (except one!) All 11 of my students had a great time...though Venice was very crowded...difficult to find large enough painting sites for all of us!! Santa Margherita was stunning.....next planned tour is in 2019...TO FRANCE!! NICE as our city location and AIX en PROVENCE as our regional one. other news........I have some vacancies in my WATERCOLOUR PAINTING CLASS at Victorian Artists' Society beginning term 2 2019!! If you would like to enrol in my class (SUNDAYS 1.30 - 3.30PM) contact VicArts on 9662 1484 or WEBSITE www.victorianartistssociety.com.au for details. Peninsula Arts Society.......Monday 18th March Demonstration: "Traveller's Sketchbok"
Peninsula Arts Society.....Thursday 18th April Workshop Inks & Watercolour.....BOOKED OUT! Emerald Art Society.....Saturday 29th June Workshop "Just Add Water!" FULLY BOOKED OUT - SORRY! Glen Eira Cheltenham Art Group......Sunday 17th November "Artists in the Round"
If you would like to attend any of these, contact Maxine: email: maxinewade8@msn.com and she will put you in touch with the relevant party to book your place. NB. Some art societies allow 'members only' attendance, others are open to non-members. NOTE: after my demonstration of my "Traveller's Sketchbook" at Peninsula Art Society, there was a strong audience interest in me running a one day workshop soon on drawing in inks and mixed media. To be announced.........YES!!! it will be presented on THURSDAY 18th APRIL 10am - 4pm in the main studio......but it's now BOOKED OUT! ALL PLACES ARE GONE. Also, Peninsula Art Society has approached me about presenting a MasterClass in Watercolour for a short period (perhaps a 6 week block). These discussions are still ongoing, and when I have any firm dates, I will publish them here!